One of the most rewarding things about working in an office in New York City is the characters you cross paths with - artists of all sorts, including painters, actors, cabaret singers and opera singers in between gigs or working to be discovered. The firm where I work is just as rich with talent as any other in Manhattan and ours even bosts illustrious alumni Renée Fleming and the late great Tony and Emmy winner Michael Jeter. 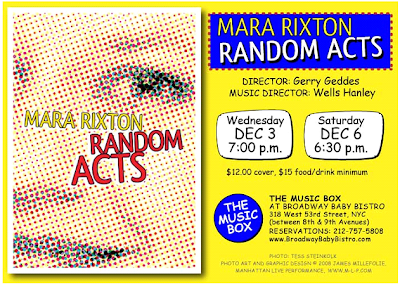 Tonight, I'm going to enjoy some of that talent at my friend and co-worker Mara Rixton's cabaret at The Music Box. Afterall, what good is sitting alone in your room when there's cabaret to be heard? that's so great that you support your actor friends like that! not everyone is so lucky to have friends like you.